JTB World’s Batch Publish for AutoCAD 2.1 has been released. This version comes with a bug fix to support paths containing unicode characters like é. This AutoCAD app simplifies the process of publishing (plotting) sets of drawings to DWF and/or PDF. This app can be used with AutoCAD (and verticals) to simplify the process of publishing sets of drawings to DWF and/or PDF. It runs as a command within AutoCAD - as opposed to a separate executable - and uses a separate executable to monitor AutoCAD's health and restart it, as needed. The status of the batch publishing operation is stored to disk, allowing it to pick up from where it left off and also for any failed documents to be retried without starting from scratch. A setting is available to only publish drawings that have been modified since they were last published, making it easier to publish sets of documents on a regular basis. With DwgInfoTip you can see the DWG version and DWG properties as an Infotip (tooltip) in Windows Explorer / File Explorer or even from file dialog boxes within AutoCAD or any other CAD software using DWG files. The freeware version only shows the DWG version and title. See also the complementary application DWG Columns for Explorer to show the information in columns in Explorer. If SECURELOAD system variable (introduced first in AutoCAD 2014) is activated (set to 1) you may see a dialog box like below. If you are not sure the executable file can be trusted do not load it. 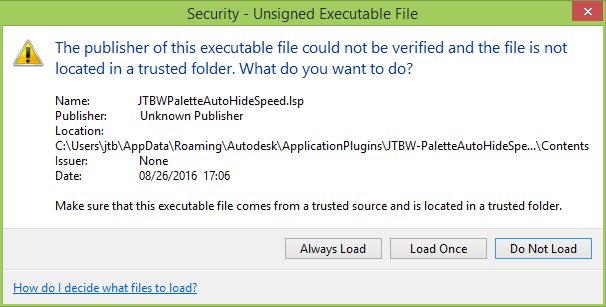 The publisher of this executable file could not be verified and the file is not located in a trusted folder. What do you want to do? Make sure that this executable file comes from a trusted source and is located in a trusted folder. How do I decide what files to load? But what if you have selected Always Load and later change your mind what can you do? There is no way in OPTIONS to do this like you can with other dialog boxes using “Hidden Message Settings”. “Security Options” does not help either. The trusted files are saved in Windows Registry so there’s a way to solve this. As always when editing the Registry be careful and backup if needed. USERTAPS below HKEY_CURRENT_USER\Software\Autodesk\AutoCAD\R21.0\ACAD-0001:409\AutodeskApps holds apps that have been manually approved. R21.0\ACAD-0001:409 (this is for AutoCAD 2017) is depending on AutoCAD version and if it’s a vertical like AutoCAD Architecture or so. If USERTAPS is deleted AutoCAD will show the dialog box “Security - Unsigned Executable File” again for all unsigned files. 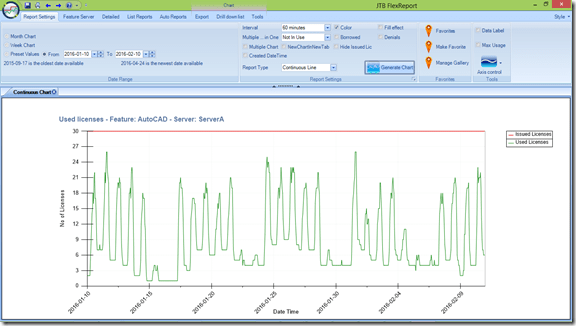 JTB FlexReport 10.2 has been released. JTB FlexReport helps to monitoring network license usage and software usage in general. With its charts and list reports you will see actual usage of often expensive licenses and be able to cut on license costs. Here’s the revision history describing what’s new and fixed in this release. This update is for all customer with current maintenance agreement. If yours has expired you’re welcome to renew it. Contact us to get a time limited license file for free. You can try it in your environment monitoring your own real license usage for a few weeks with full functionality. Support is free so if you run into any problems or have any questions we’re here to help you.